Missouri border ruffians like Charles Hamilton led raids into Kansas to steal goods and harass freestaters. Linn County was the site of some of the raids, including a particularly deadly one May 19, 1858. Hamilton and some 30 other men rode through the village of Trading Post, captured 11 free-state men, and marched them into a ravine where they opened fire upon them. Five of the men were killed, five were seriously injured, and one escaped unharmed. The community was drawn together in the face of these events even as they were unfolding. Sarah Read, wife of the captured Reverend Benjamin L. Read, set off on foot, spyglass in hand, to chase down Hamilton and his men. She came upon the victims, some still alive, and tried to render aid. 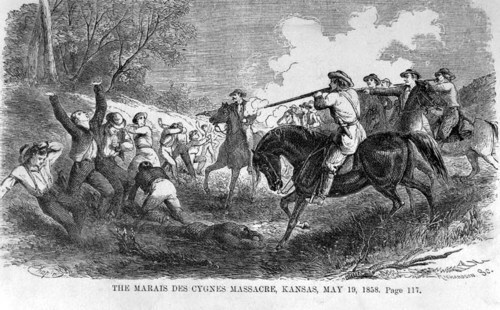 Word of the massacre spread quickly and by afternoon freestaters from around the area had gathered to treat the wounded, collect the dead, and help James Montgomery’s Jayhawkers ride into Missouri in fruitless pursuit of Hamilton’s gang. Locally, wrathful indignation accompanied feelings of shock. John Brown, arriving at the scene toward the end of June, built a "fort" some 220 yards south of the ravine. It was reported to have been two stories high, walled up with logs and with a flat roof. Water from a spring ran through the house and into a pit at the southwest corner. In later years Hadsall built a stone house adjoining the site of Brown's fort, enclosing the spring within the walls of the first floor. In 1941 the Kansas legislature authorized acceptance of the massacre site, including Hadsall's house, as a gift to the state from the Pleasanton Post, Veterans of Foreign Wars. In 1961 it provided funds for the restoration of the building, and in 1963 the entire property was turned over to the Kansas Historical Society for administration. A museum was established in the upper floor of the building in 1964. Today the park is operated as Marais des Cygnes Massacre State Historic Site, a drive-through interpreted setting. Whose bloom is of blood.